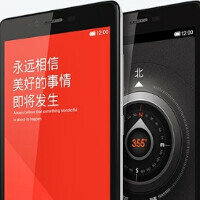 Chinese handset manufacturer Xiaomi sold 100,000 units of its Redmi Note in just 34 minutes back in late March. Xiaomi was using the technique known as "Hunger Marketing," in which a ridiculously small number of units is put up for sale online, almost guaranteeing a headline producing sell out. The company has two different models of the Redmi Note. The unit priced at 999 Yuan ($161 USD) features an octa-core 1.7GHz MT6592 CPU under the hood, with 2GB of RAM and 16GB of native storage. That version not only racked up the quick 100,000 in sales, it also scored an impressive 28,000 on AnTuTu. The 799 Yuan version ($130 USD) has an octa-core 1.4 GHz MT6592 CPU under the hood, with 1GB of RAM and 8GB of native storage. It is this lower priced model that Xiaomi tweeted about on Thursday, when it accidentally reported that it had taken pre-orders for 122 million units of the Redmi Note. Obviously a mistake, Xiaomi said that the actual amount of pre-orders it captured for the Redmi Note was 15 million units. That still would be an amazing debut for Xiaomi's 5.5 inch phablet, considering that the Apple iPhone 5s and Apple iPhone 5c together combined for 9 million units sold over the pairs' first weekend on sale. And that 15 million would also top the opening weekend sales of Samsung's hugely popular Samsung Galaxy S5. But before you go ahead and crown the Xiaomi Redmi Note as one of the world's most popular handsets, keep in mind that Xiaomi's definition of what a pre-order is, might be a little more liberal than most companies. Xiaomi not only includes pre-orders that involve a paid reservation for the phone, but also includes people who signed up just to be notified when more information about the phone is available. No money changes hands on those pre-orders. Since Xiaomi won't reveal the actual paid number of pre-orders, we can assume that it is lower than 15 million. In fact, it might just be a much lower figure. Still, it doesn't take away from your ability to purchase a true octa-core powered phablet, with a 5.5 inch screen and a 13MP rear snapper, for just $130. Wish I could just place an order with OnePlus instead of having to play social networking games. 122 million Pre orders!!!....... you drunk xiaomi? ?